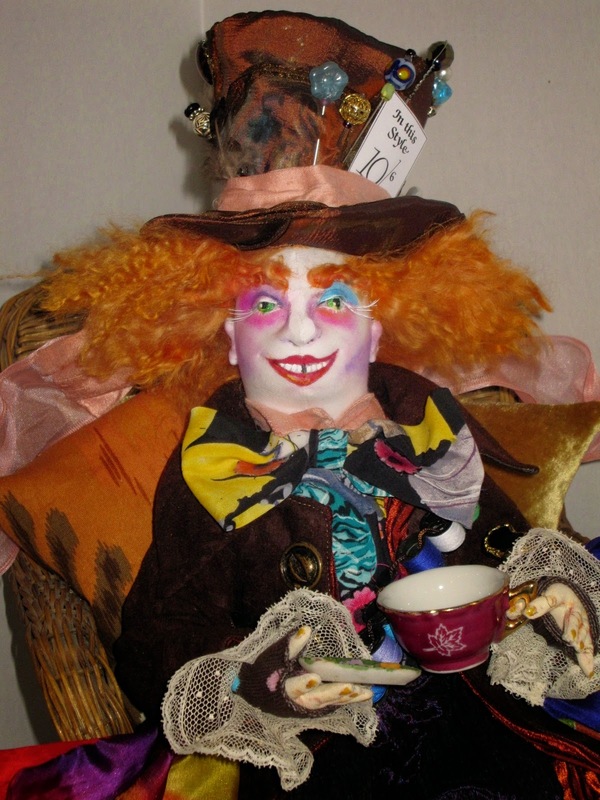 I finished my Mad Hatter and I love him! 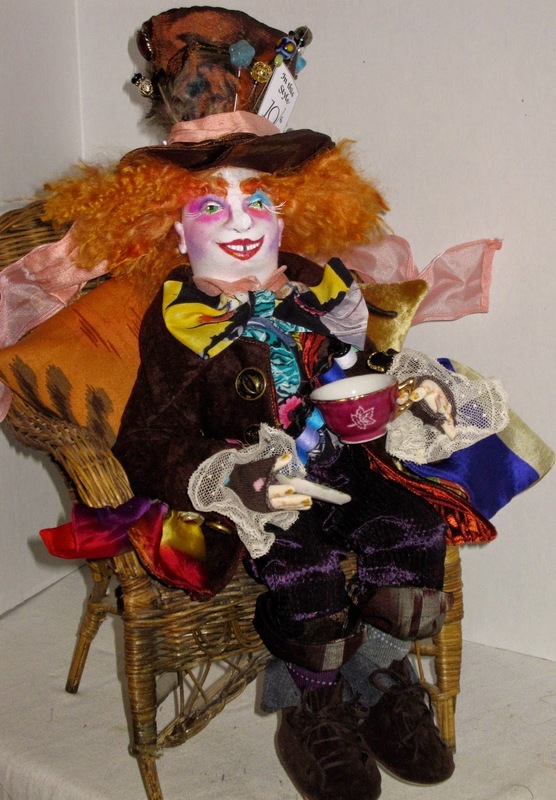 My inspiration was Tim Burton's adaptation of Alice with Johnny Depp playing the role of the Mad Hatter. 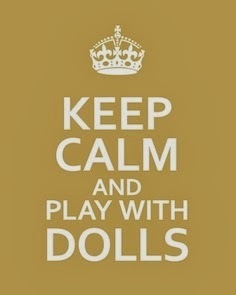 If you have not seen the movie, I would recommend it to all who love Alice in Wonderland. 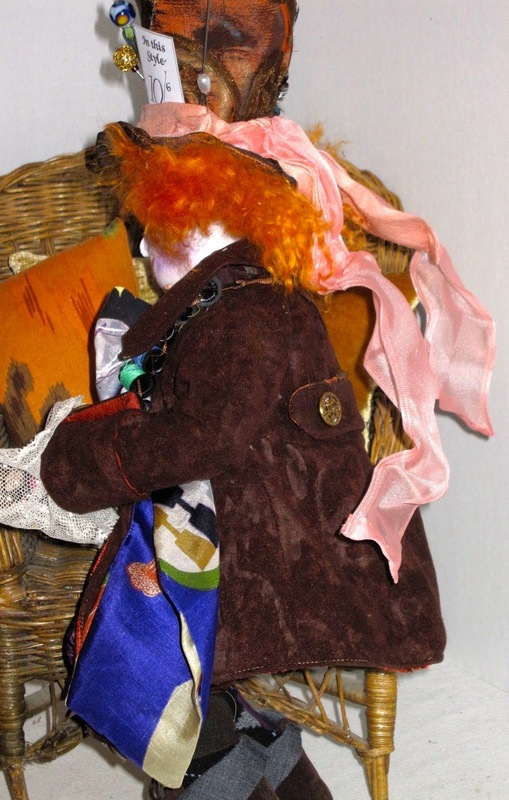 Here is a photo of the Mad Hatter with possibilities for my fabric choices. To start my project, I used Sylvia Schorr's pattern (Murray, the Mad Hatter) as my basic template. I changed the size to make him about 16" seated rather than 18" and I changed the arms and the clothing and face painting to match my inspirational photo. Here is the painted face (does look a wee bit stark without his hair and hat). To paint his face I used white and barn red acrylic paint (eye ball, teeth and lips). I used Pigma permanent markers for detailing the teeth, nostril, eyeliner and eye shape. To apply his very cool makeup, I used watercolour pencils and coloured chalk. His bushy eyebrows are a snippet of the Tibetan wool that I am using for the hair (glued on). The eyelids are make from the same cloth as his face (basically a white tightly woven fabric). Notice that I used a plastic teddy bear joint to make his head swivel so that he can be posed. His collar will hide the slightly messy neck line. 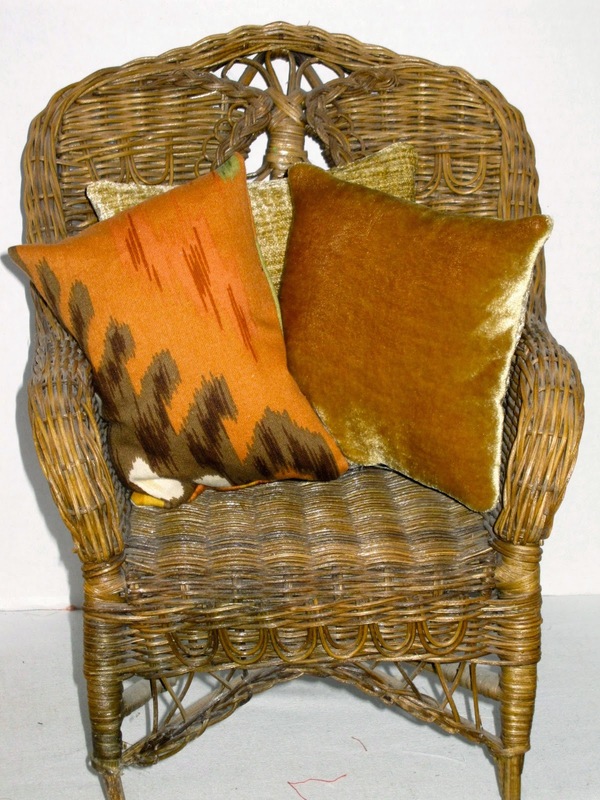 I found the perfect wicker chair and made fabric cushions so that he could sit comfortably. 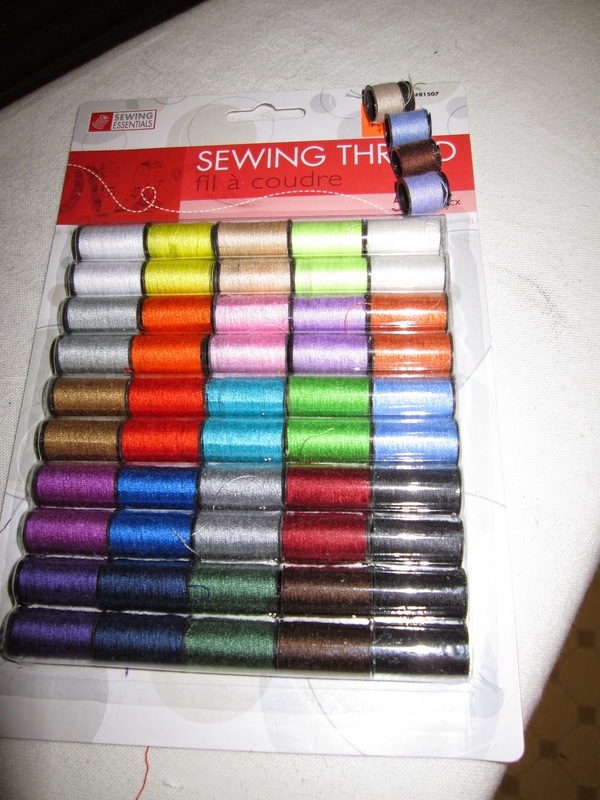 The half size spools are at the top of the package and are only about 10 cm long. He has a porcelain tea cup of course. A close up to see his hat. I used crayons to add colour to the rust fabric. I also added fake eyelashes that I painted white. The Mad Hatter says have a mad, mad day! I have always loved the Alice in Wonderland series and this year I have decided to try and made a few of the characters (there are so many to choose from!). I have started with Alice of course. This wee Alice is about 14" tall. 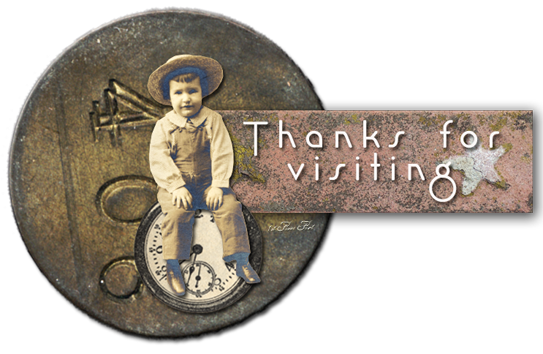 I started with a great face mould by Sherry Goshon (Gillie face mould) from Dollmakers Journey website (great place for cloth doll supplies). 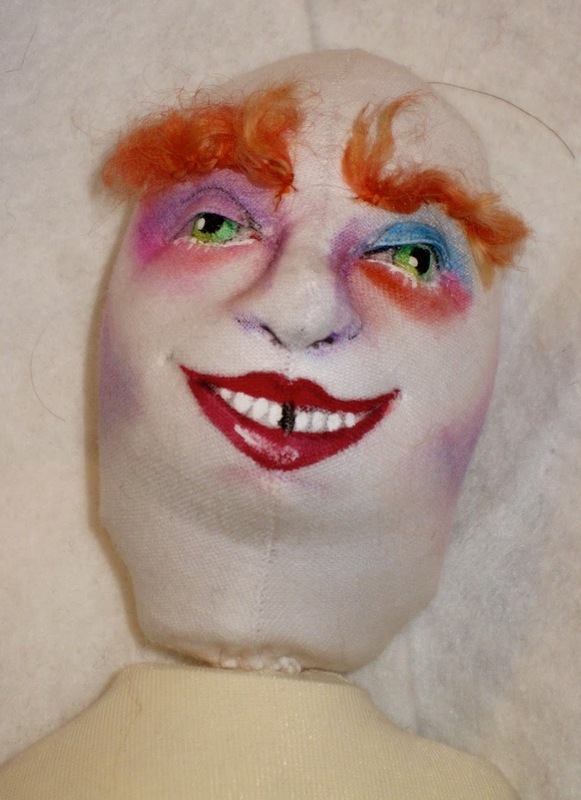 I used paper clay for the face and then covered it with stretch fabric. The body is all cloth and is a mix of different body patterns that I altered to make her stand and hold her two bunny friends! 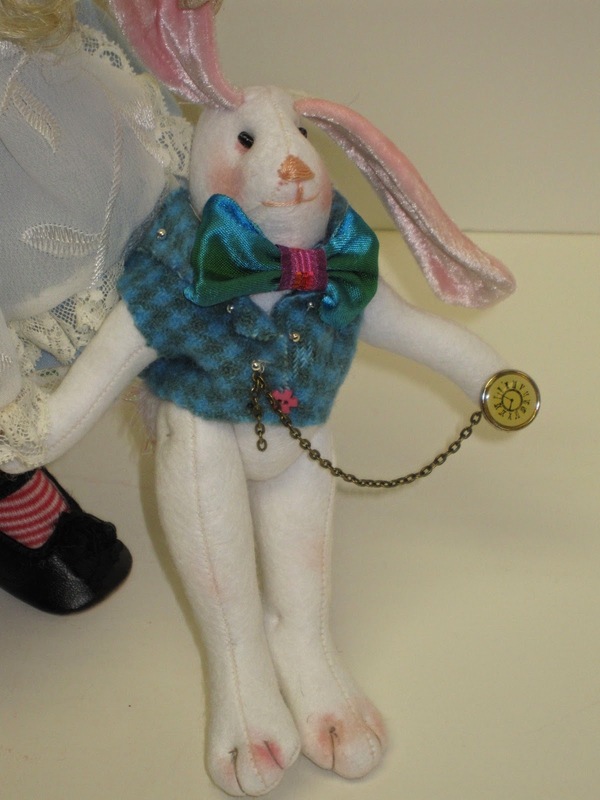 Her hands are wired, using pipe cleaners to hold her felt white bunnies. The bunny with the bow tie is the city bunny and the other is her country bunny. Alice has always loved bunnies even before her trip to Wonderland. 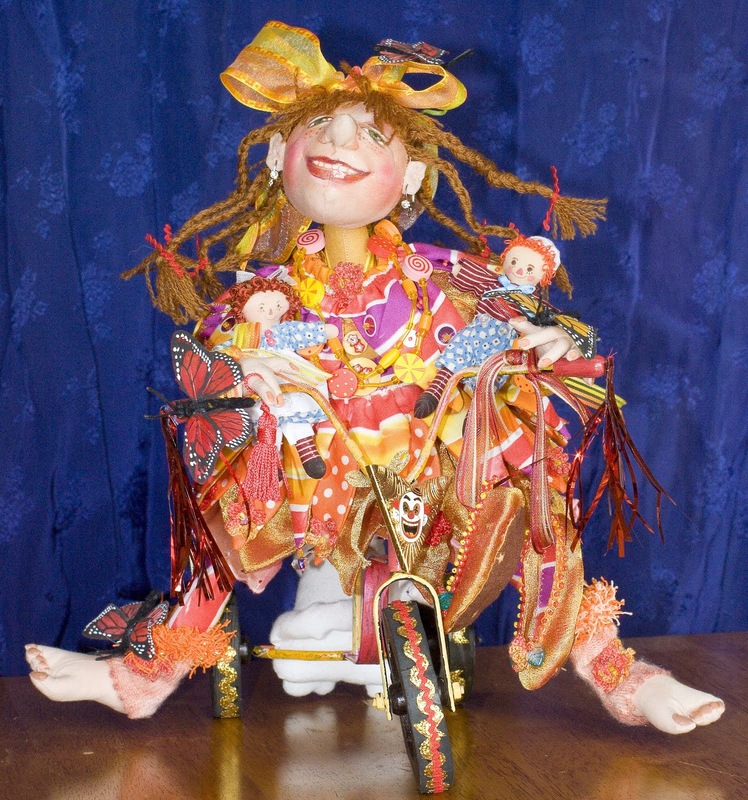 Alice stands on her own due to the wire inside the legs and her sturdy shoes. 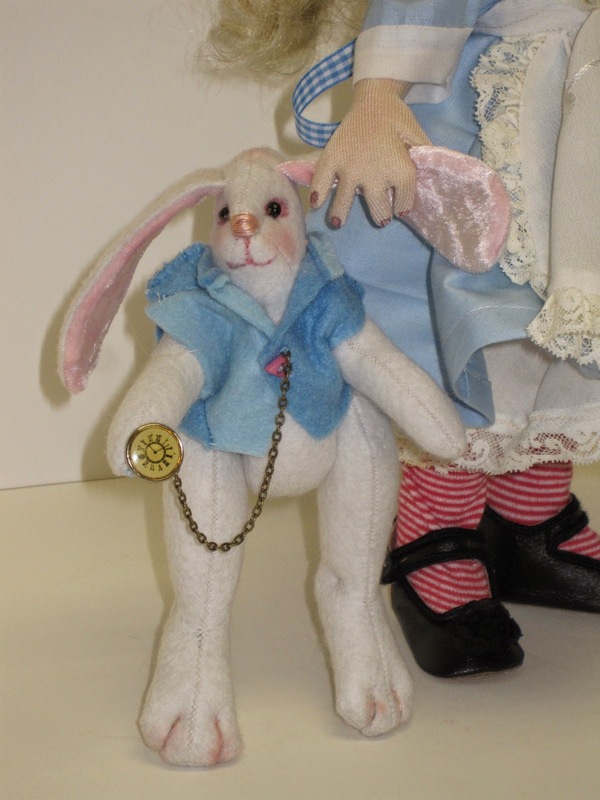 The clothes on Alice were made using a pattern by Judi Ward. She has a petticoat and drawers as well as striped tights. Her hair is a synthetic doll wig that I had in my stash and which was perfect for her. 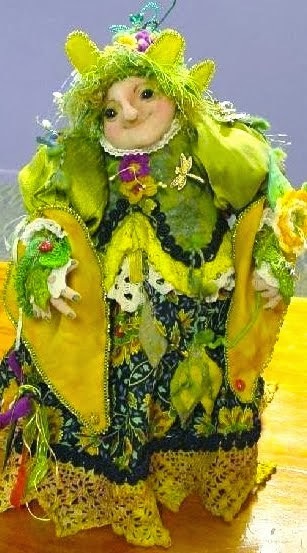 Her face is painted with acrylic paints and pigma pens. 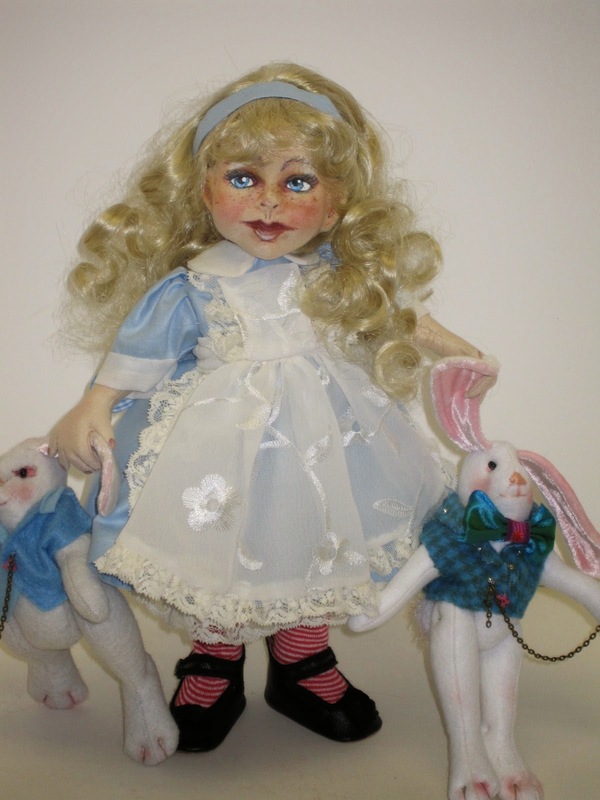 Her "country" white rabbit is all felt with an embroidered nose. Her "city" white rabbit sports a silk bow tie. 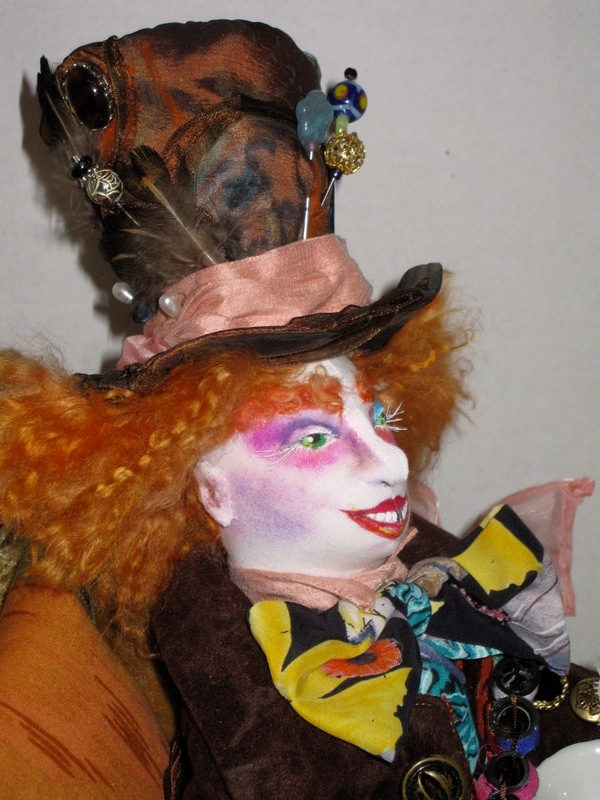 Next month I will make the Mad Hatter! 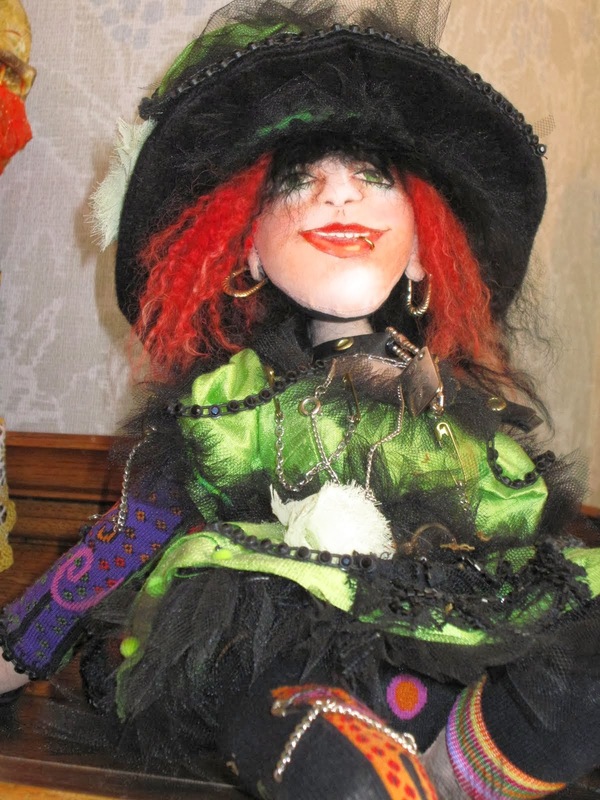 In December 2014, I displayed my dolls at "R place" hair salon in Vic West (Victoria, BC). 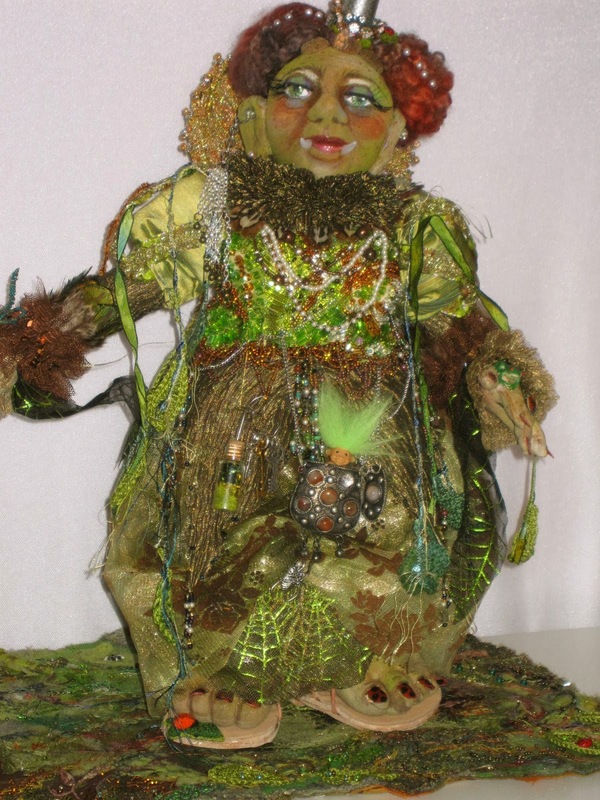 One of the salon's customers asked me to make a special doll to display in her shop window. Chris is the owner of "Lilaberry" a unique home decor store in Sidney, BC located at 2474 Beacon Avenue. I always love visiting her store as she has unique items for the savvy home owner or anyone wanting to purchase a special item for a friend. Needless to say I was thrilled with this opportunity. 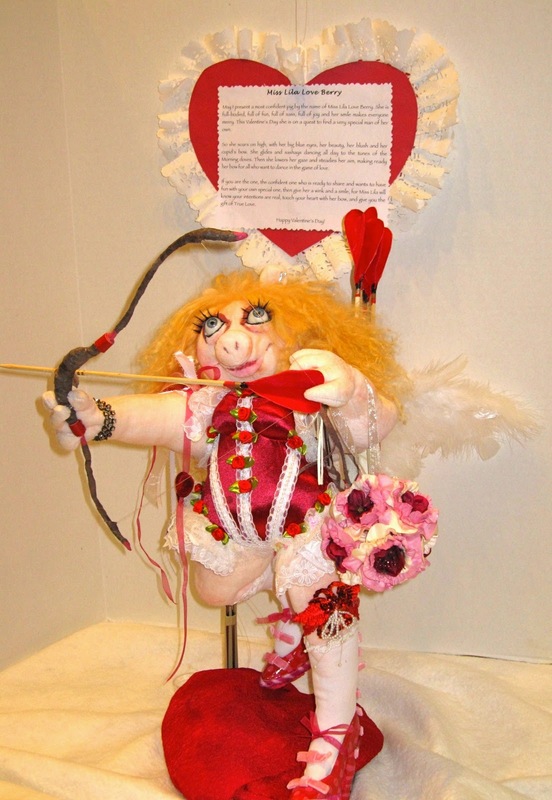 Chris wanted a curvy "cupid pig" for her window display for Valentine's Day 2015. I went to work starting first thing in 2015 . I knew I needed a template for a voluptuous woman and I used Lynn Butcher's "Beach Babe" pattern for the body template. I had to alter both the leg design and the arm design as well as making a "pig" head complete with a cute snout and ears! I used a light pink velour for her body and face. 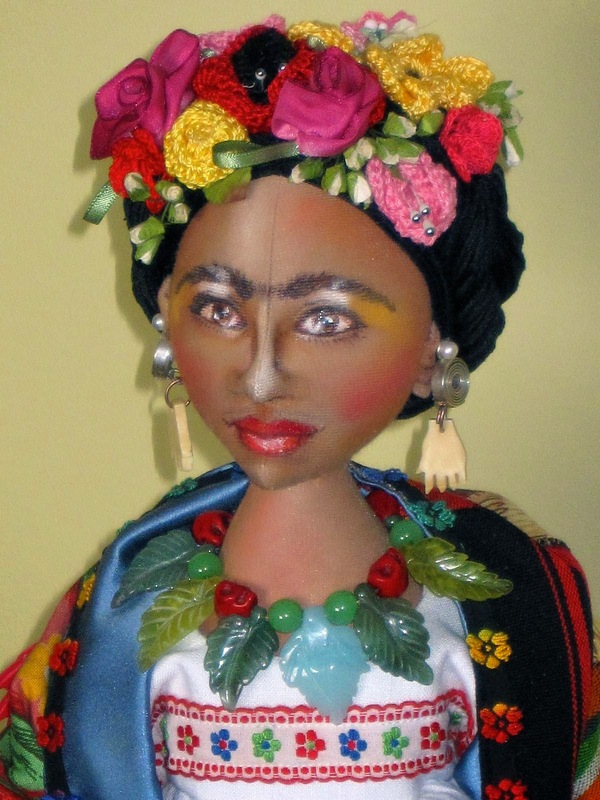 I needle-scuplted the face and added glass eyes with big false eyelashes. 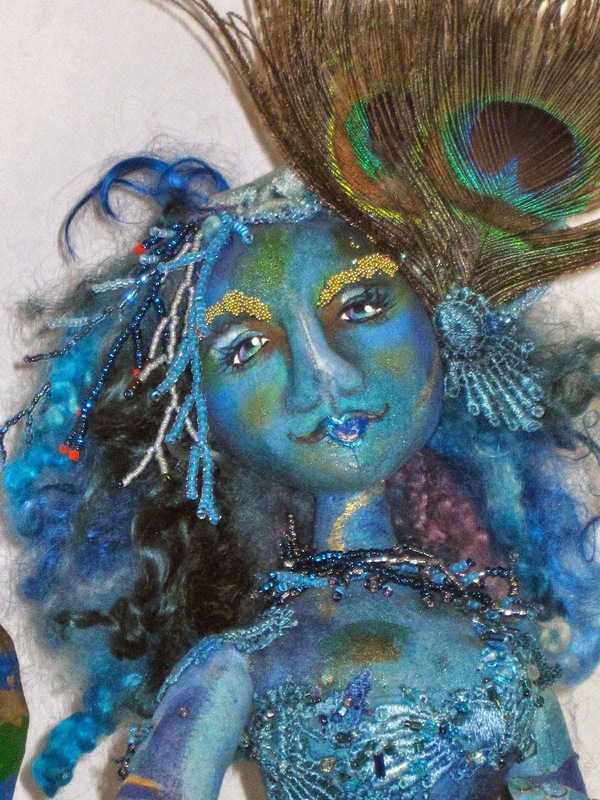 Her hair is tibetan mohair-a perfect shade of blonde to complement her big blue eyes. Next I worked on her "Victoria Secret" lingerie and used a swim suit material in a dark red/fushia. 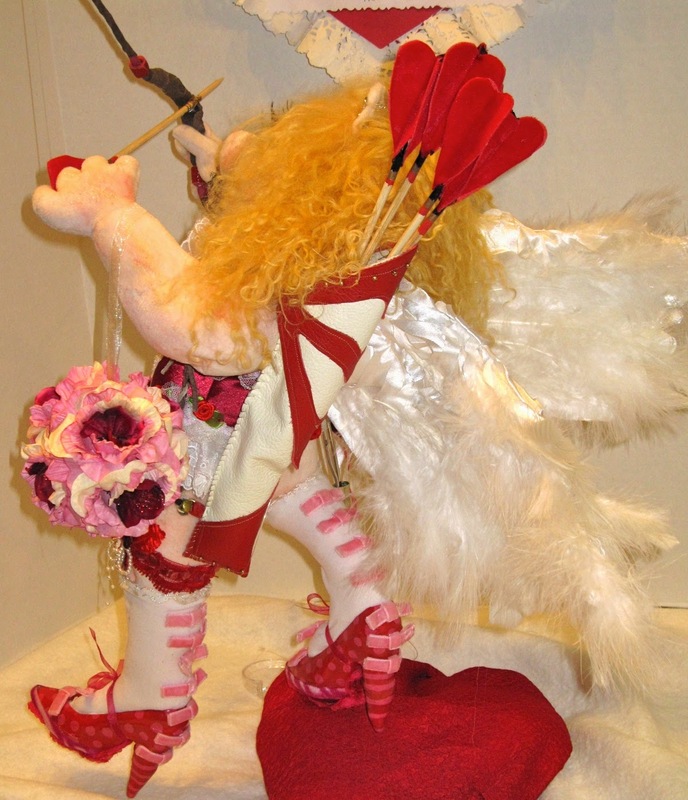 I added lace and rosettes to make it frilly and appropriate for a Valentine cupid! You can clearly see her quiver over her shoulder equipped with more "love" arrows. I used a simple plastic shoe and "jacked up" the heels using wire and paper clay so that she could have not just pumps but stilettos! I painted the shoes red and added pink polkadots. 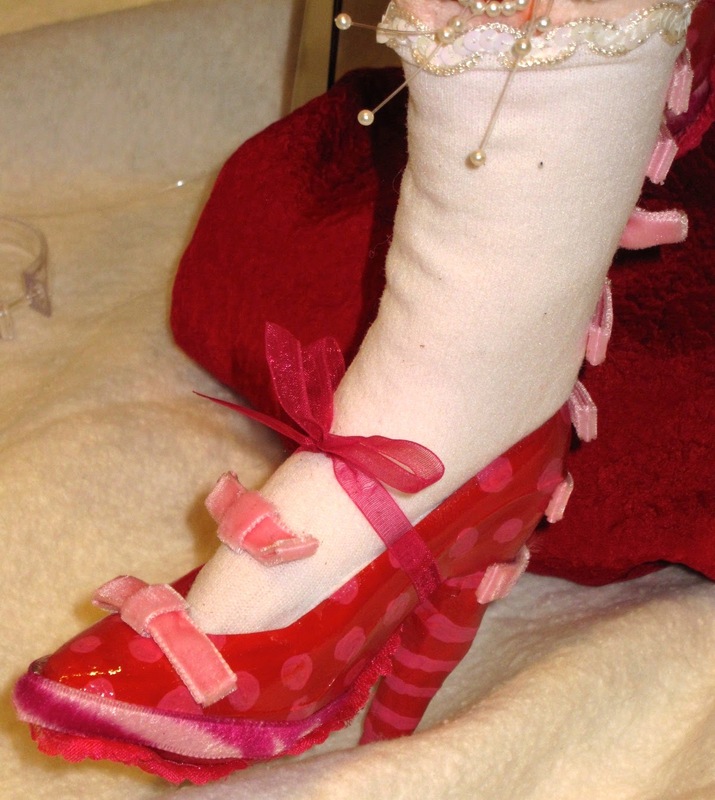 I then added a fabric sole to balance out the stiletto heel and adorned the back of the shoe with velvet pink bows which I continued up the back of her white stockings. She has a blingy garter piece on there left leg! She is also wearing bling on her wrist and in her ears! The wings are satin with lots of fluffy white feathers. 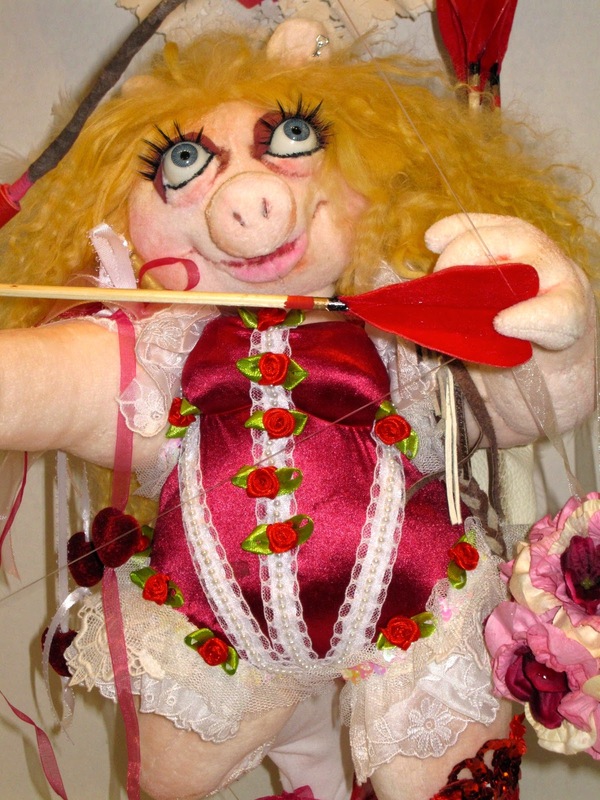 Finally she carries a pink/ivory/red flower purse-now she is ready for love! Closeup of her shoes showing the paint job and customizing. Here is the finished piece measuring 22' high and 22" wide. "May I present a most confident pig by the name of Miss Lila Love Berry. She is full-bodied, full of fun, full of sass, full of joy and her smile makes everyone merry. 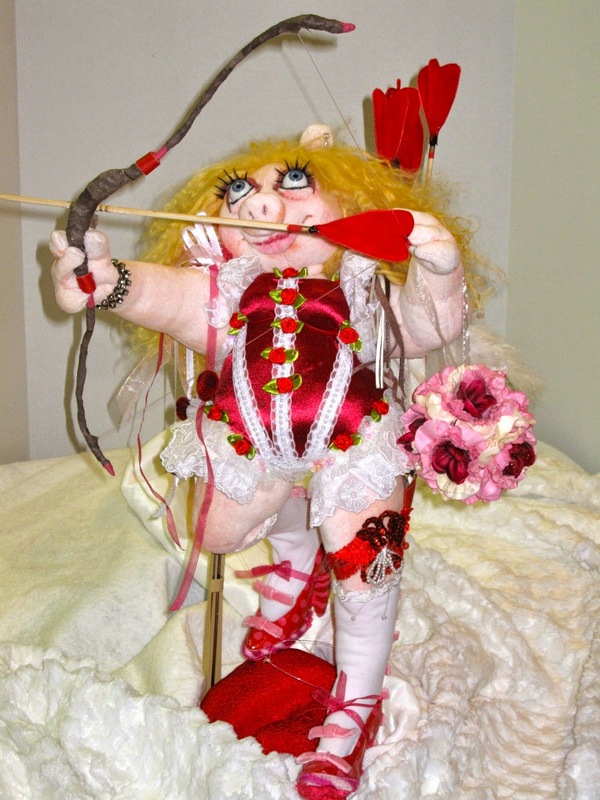 This Valentine's Day she is on a quest to find a very special man of her own. So she soars on high, with her big blue eyes, her beauty, her blush and her cupid's bow. She glides and sashays dancing all day to the tunes of the Morning doves. Then she lowers her gaze and steadies her aim, making ready her bow for all who want to dance in the game of love. If you are the one, the confident one, who is ready to share and wants to have fun with your own special one, then give her a wink and a smile, for Miss Lila will know your intentions are real, touch your heart with her bow, and give you the gift of True Love. Happy Valentine's Day!"